The brief for this assignment was to create four images to be used within a campaign for a supermarket to package and promote a range of seasonal foods. My first step was to look at promotional images in supermarkets, in particular Marks and Spencer because the brief stated the illustrations are for a supermarket renowned for the quality of the food they supply. All of the images found were photographs so weren’t much help in terms of illustration but they did all have one thing in common, they show the food looking fresh, delicious and appealing. I then researched food illustrators and came across Tom Hovey who illustrates for the Great British Bake Off. It is clear that his work is based on observation but that he adds his own twist to give the food character. Many of his illustrations have a comic style to them. If food illustration is to provide a carbon copy of the subject then photography may as well be used, therefore I believe that adding a bit of character is important. My goal for this assignment then was to produce the objective drawings required by the brief, but with a sprinkling of subjectivity. This would also be using the skills I learnt in the objective and subjective drawing exercises. The images created are to be used within a campaign so for this reason I chose not to include text with my illustration assuming this would be added at a later date. 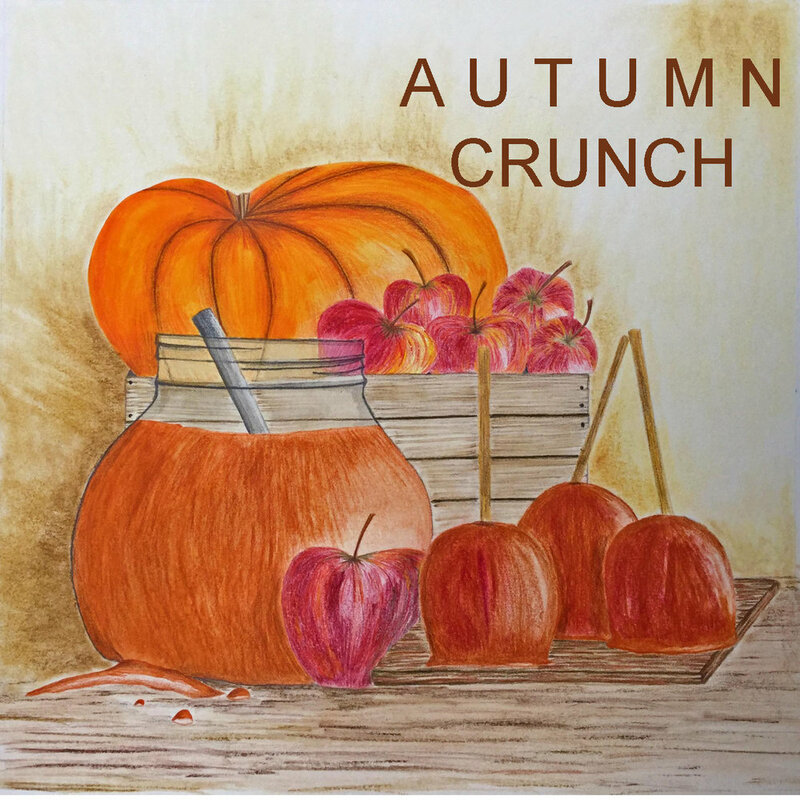 The seasons to be represented by the artwork were summer and autumn. I started by making mind maps around each. To represent summer I chose cucumber because it had most connections with the ideas about summer I mapped alongside types of produce. It is green, refreshing and cool, it screams summer. My illustrations had to be objective and based on direct observation. For this reason I started by drawing close observational pencil drawings of cucumber cut in different ways. This really helped familiarise myself with the different parts of a cucumber and also its tonal values. While carefully looking at the cucumber, I noticed the water bubbles that are present when you first cut one open. This really gives the sense of freshness and was something I really wanted to convey in my illustration. I made a colour, texture, technique moodboard on cucumber to ensure my images were objective. Then I made some quick compositional sketches before starting the final piece. From these sketches I worked out that I wanted to show the cucumber in two sections cut on the slant. I think it looks most appealing cut like that. As a result of making my moodboard I worked out that I wanted to use watercolour to create that translucent quality on the inside of a cucumber and use coloured pencil and oil pastel to add texture. Completing the pencil drawings previously really helped me complete this final illustration. I found it fairly quick and easy because I had given myself a good understanding of the construct and tone. It is an objective drawing although you could say that my addition of lots of water droplets to portray freshness means it is subjective. Overall, I think my illustration makes the cucumber look fresh and appetising, even in the middle of winter! In addition to an image of the produce itself, the brief required me to create an image that reflects the produce chosen and aspects of the season itself. I wanted to have something in the image that cucumber can be used for. This way, the supermarket gets to make link sales. Pimms immediately sprang to mind and had featured on my initial mind map. I started by making sketches of different jugs that I could show the Pimms in. I think I got a bit carried away with this and perhaps should have done this after the compositional thumbnails because the composition I chose in the end didn’t really showcase the jug! I chose the composition shown in the photos on the right having looked through food magazines and noticing that food is often photographed from above. I chose to use the same media to create this illustration as those used for the cucumber. I also continued the water droplet theme by showing condensation on the jug and glasses. I think this suggests the Pimms is cool and refreshing, although I think I actually could have added more. As Pimms is usually drunk outside in the sun, I chose to have a garden table as the background and chose white so the background didn’t impose on the subject of the image. 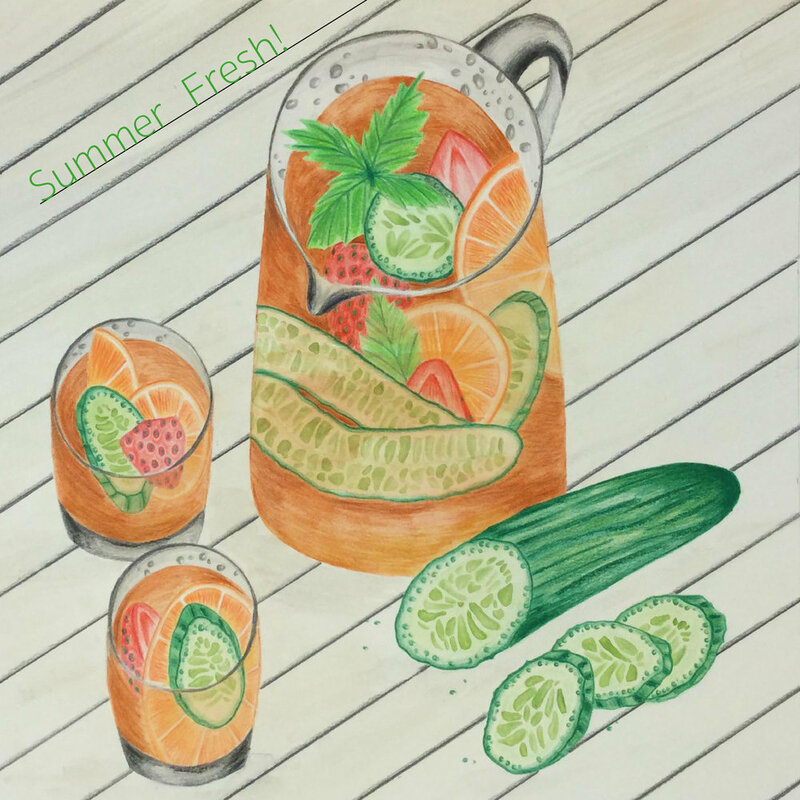 I think I have showcased cucumber in different ways in this illustration and I think it depicts summer. Once completed, I adjusted the vibrance of the colour in photoshop and used Indesign to add text. I thought the text needed to be added diagonally to maintain the line created by the table background. I used a thin line sans serif font to give a fresh clean look. For autumn, I originally chose squash because the colours are so indicative of the season. As with the cucumber, I made an observational drawing, compositional thumbnails and moodboard before starting the final image. Part way through the artwork shown above I decided I didn’t like the composition I had chosen, it wasn’t balanced correctly and while I was happy with my technique, I didn’t feel I was able to give the squash any character. I also couldn’t see it as part of an interesting autumnal scene. So I fell out of love with the squash and went back to my mind map, on which apples featured three times in different forms. Autumn is full of texture; crunchy leaves, crackling bonfires and bumpy pumpkins. I wanted to convey this through my choice of media. 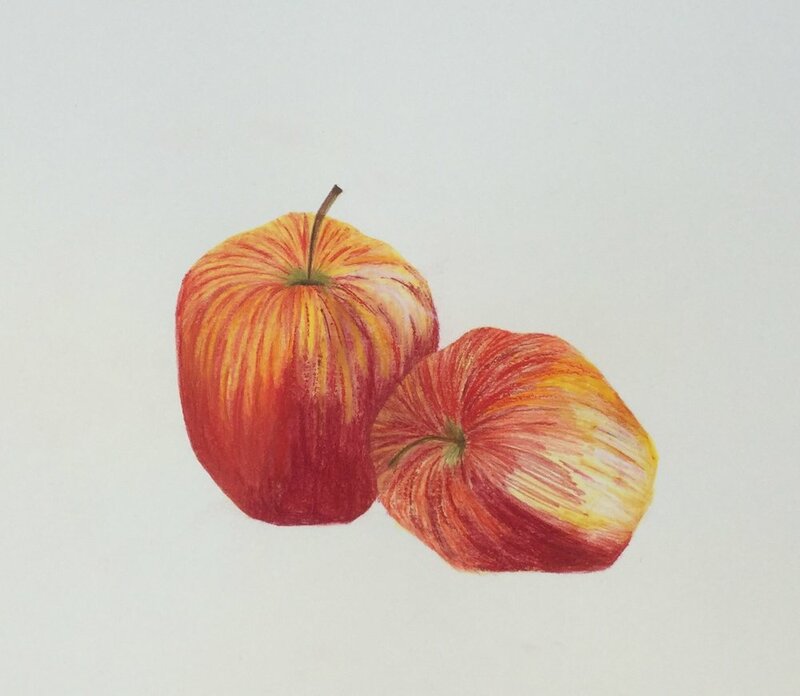 To start my apple illustration I chose chalk pastel to give it texture, however I was unsure about whether the texture worked next to the coloured pencil I was also using so I started again with gouache. (Shown below) . This looked too flat so I went back to the original I had started with pastel. Next to the gouache version, the pastel and pencil seemed to work well after all! I was using pastel for the darker part of the apple and coloured pencil and oil pastel for the lighter parts. Completing it like this meant that the apple appeared to be in two halves. One side was too nebulous and the other too defined. I did even this up, but not too much because it was an objective illustration and the apple I was drawing from did have this quality. I have added light but chose not to use shadow on the apple on the left for fear of making the fruit look unappealing. In the same vein as the cucumber and Pimms images, I also wanted to feature apples in an illustration with something they can be made into or used with. 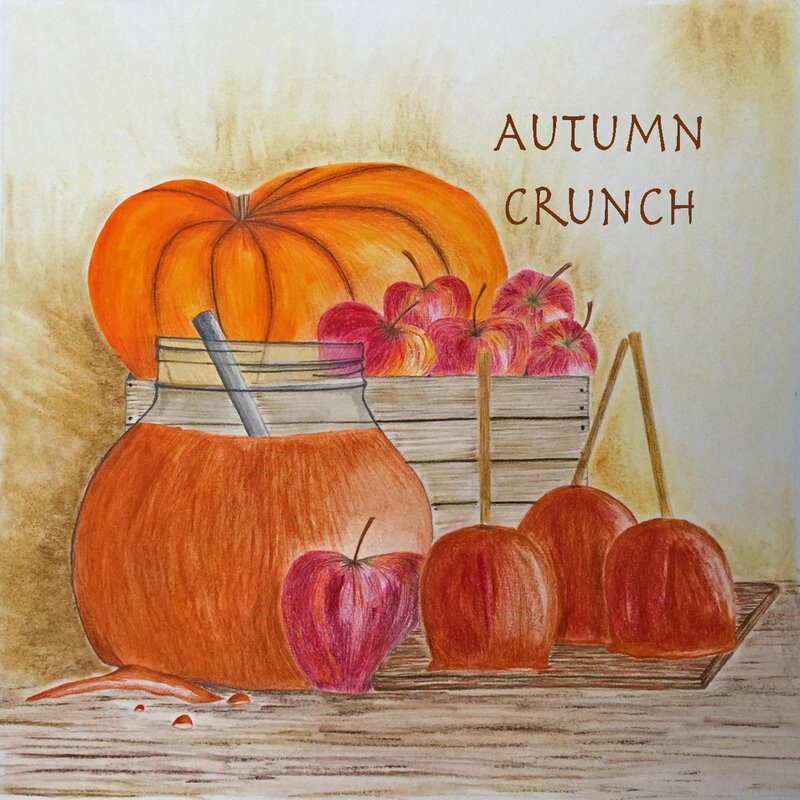 Toffee apples were on my mind map which are very autumnal in both colour and seasonality so I chose to focus this illustration around those. I draw out some thumbnail sketches, playing about with items to be in the image and with the composition. I finally landed on a composition I was happy with. It included apples, raw and toffee, a jar of toffee caramel and a pumpkin to further develop the autumnal theme. I chose a side view so that it would be different to my jug of Pimms illustration and to showcase the toffee apples and sticks most effectively. This was also a composition that would work in the square format required by the brief. I had some problems scaling up from my original small thumbnail to a larger version while also trying to consider the relationship between background and foreground and the hierarchy I wanted to convey in the image. Although in the foreground and more ‘important’ in the image, I didn’t want the jar to appear bigger than the pumpkin. I needed the toffee apples to appear bigger than the apples in the crate because they are covered in toffee and are in the foreground. From the larger thumbnail, I then made an even larger visual using pen to explore tone. Between these two drawings I changed the angle that the chopping board is shown. It didn’t seem to make sense perspectively in the earlier drawing. To create the final illustration, I used a mixture of gouache, watercolour, chalk pastel and coloured pencil. It was very important to me that I convey a sense of texture and I think I have achieved that. I was worried about adding the background in case it detracted from the illustration so I looked at still life paintings to see what sort of backgrounds tend to be included. Generally they are rather plain with a big focus on light and shade which is what I tried to create. I wanted the colours to be autumnal without being more of the same so I used browns instead of oranges. I am happy with the result and thinks it adds context to the image. Overall, I think it depicts the season of autumn and makes the produce look inviting. In addition to the shadow on the wall though I think I should have added shadow on the apple crate cast by the toffee apples. 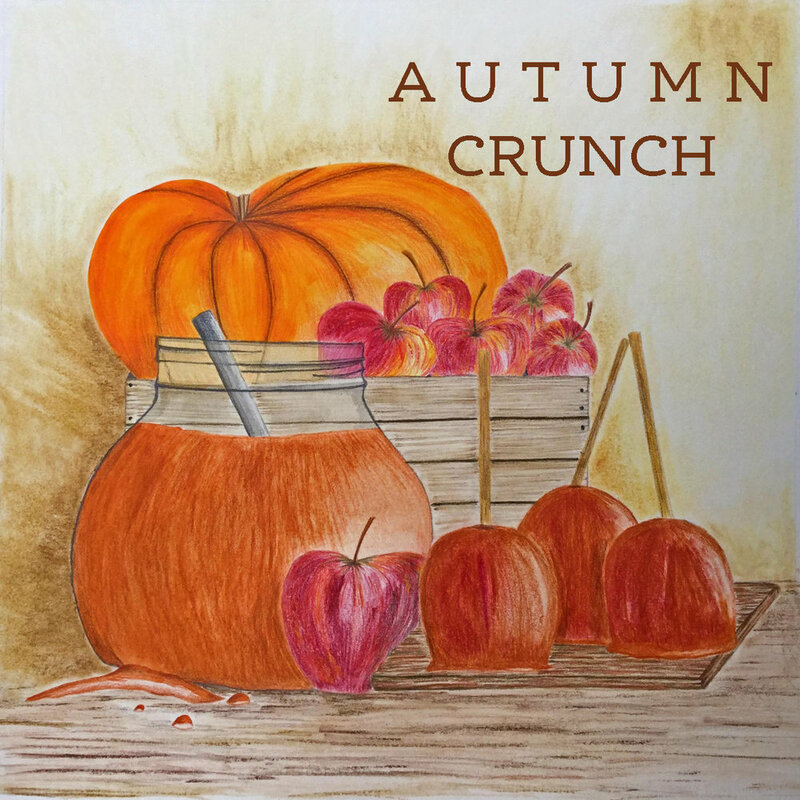 As with the summer artwork, I adjusted the vibrance of the Autumn image and experimented with fonts. I feel that the fonts on the left and inn the middle are most appropriate because the serifs induce more of a textural autumnal feel. I chose the one on the left to use in my final artwork. I have been drawing more from observation and will continue to do this before illustrating. I will make sure I am more thorough in exploring the potential of each brief and draw upon creative process methods learnt so far in future work. My passion lies in traditional art but I want to continue to stretch myself and can see the potential digital programs have in refinement and editing so I will explore these more fully in the next unit. This will also involve exploring my illustration in the context of graphic design. Having recently read the chapter on visual metaphor in ‘Illustration: A Theoretical and Contextual Perspective’ by Alan Male, I made that my starting point for this exercise to ensure I had a proper definition. “A generalised definition of visual metaphor might suggest the description of an image that is imaginative but not literally applicable. When applied to the discipline of illustration, it is commonplace to describe this form of imagery as being conceptual.” Male, A (2017) From this definition and further reading in this book, I them explored illustrators working in this imagery form. 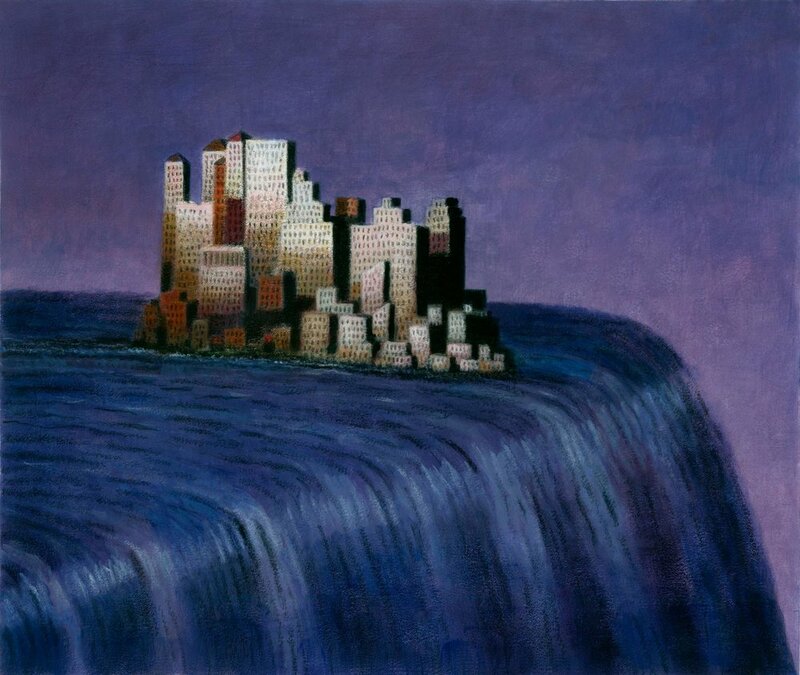 Marshal Arisman and Brad Holland both have a surreal quality to their work and surrealism is a movement considered to have been the “biggest influence on conceptual illustration“ Male. A (2017) . A lot of work by Anita Kunz makes statements about politics and world affairs. She provides social commentary through her work. As a result of exploring conceptual illustration and visual metaphor, I can appreciate the power it can have in challenging ideologies, raising awareness of issues and bringing humour to situations. When talking about Portuguese illustrator Pedro Lina, Mark Wigan explains that “He sees illustration as a catalyst for social change, encouraging people to rethink and question society.” Wigan. M (2014) . Reading this made me think about Banksy and his use of satirical street art as social commentary. The photo below is one I took of his piece in Dover commenting on Britain’s exit from the EU. This inspired me to read ‘Planet Banksy: The man, his work and the movement he inspired. "‘ compiled by Ket. 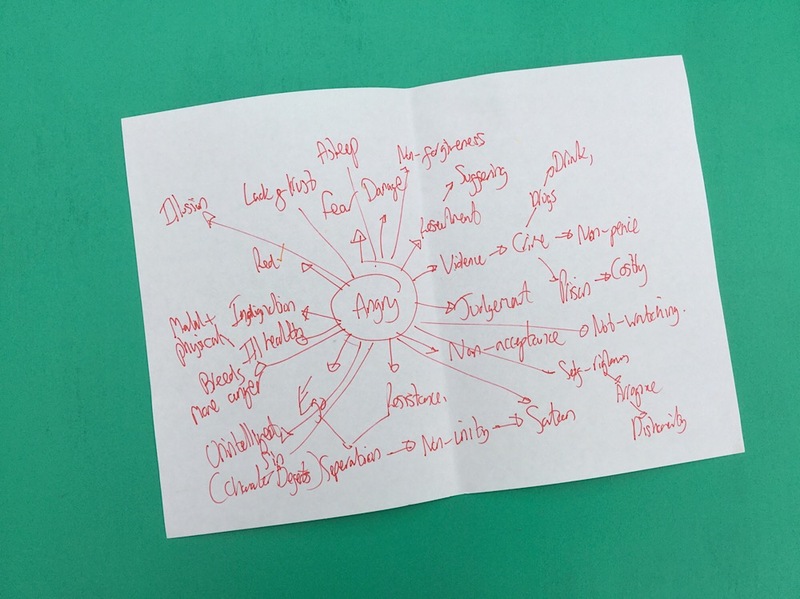 The brief for this exercise was to choose a phrase from a list and create images that symbolise the phrase. I chose ‘censorship of the press’ and made a mind map to generate initial ideas. Apart from some very obvious ideas about gagged newsreaders and doctored newspapers, my thoughts about censorship of the press were centred on what they choose to tell us, how they create fear by using embellishment and hyperbole to inflame and sensationalise. The press is very subjective and needs to be looked at in a certain way in order to filter out the lies and storytelling and extract the truth. I made a few drawings exploring these ideas which I think convey them effectively. When I showed them to other people, they could see what they symbolised. However, I did rely on words in most of them and the majority of conceptual art and visual metaphor I looked at doesn’t include text. I found it very difficult to convey these ideas without words. Ideas such as: subjectivity, lies, truth, blame and fear are intangible and difficult to portray visually. I adapted the picture of the member of the press painting two entirely different pictures of a person or event by keeping the text limited to a name badge. This was a difficult phrase to choose, particularly because I have my own strong opinions and thoughts on the subject. I guess that is what made me choose it. But I think it may have hampered my thinking and made the exercise more difficult. There is an illustration by Richard Borge featured in ‘Illustration: A Theoretical and Contextual Perspective’ by Alan Male about censorship that would work well when thinking about censorship of the press. This is shown below. I think if I had gone along the route of tangible ideas like locking up microphones, cameras and pens with keys and chains, then I would have been able to come up with more visual images. This exercise was all about choosing content for an illustration based on an extract from ‘The Daffodil Affair’ by Michael Innes. I started by retrieving literal cues from the text to build a picture of the main character. He is a middle aged man working at New Scotland Yard who has been controlling a file of police papers on a case for 15 years. He is full of an anger that has increased with each of those 15 years that have passed. There isn’t much more literal information to go on so inference, deduction and imagining were needed to form a bigger picture. The text doesn’t actually say he is a detective, but that is the immediate inference I made. I imagine a 1940s noir style detective with a flawed, anti heroic character. The visual image that sprang to mind was Humphrey Bogart in the ‘Maltese Falcon’. Perhaps his anger is at himself because in fifteen years he still hasn’t solved the case of the abducted girls. The anger could be directed at the person or people responsible for the kidnapping. The abducted girls were ‘feeble minded’, which was a term used to describe people with mental deficiencies. When crimes are made against vulnerable people, a deeper level of anger can assume. He is so preoccupied with the case, his anger or both, that the stark, empty nature of his office surroundings does not bother him. I get the sense that this man is rather jaded which is reflected in his surroundings. His dress would be formal work attire which would be a suit with jacket and waistcoat, braces, tie and smart shoes, as was usual for a man of this era. He is inside so his hat and coat would be hung up somewhere in the office. The colours of his clothing would be black, grey or brown, possibly navy blue. Furniture is limited in the office. The room is ‘unquickened’ which means it is void of any life, energy or spirit, something which is mirrored in the man’s character. He hasn’t added any personal belongings to the space and I don’t imagine the room to have been painted in recent years. There is a large desk, onto which a parallelogram of light is cast through the huge plate glass windows. This is described as being ‘functional’ which would suggest the room is dark with no artificial light. The windows don’t have curtains. The man is described as sitting down so there must be a chair of some sort at the desk. Before looking at reference I made some quick sketches of the image in my mind which was primarily focused on the parallelogram of light. There is quite a lot of reference in the text to light and light is a hugely important feature in noir imagery, therefore I wanted to make it central to my illustration. I then searched for images that matched my own vision. They included a photo of 1940s Scotland Yard detectives as I imagined them and two depicting detective’s offices. One has light streaming through blinds and the other has the sepia type colouring I imagined when reading the text. The word I chose from my list of words connected to my visual idea was shadowy. The moodboard I created was focused on colours I associate with the word shadowy, some found textures and created textures using a range of media. My sketches of the character were all head and shoulders based. I wanted to focus on the face because it something I haven’t done on a large scale before. I tried creating angry, jaded expressions. In terms of composition I wanted to include the window but have minimal amount of the rest of the room due to the face being the focal point. On photocopies of my drawn outline, I practised use of light in the drawing. The images I had found with blinds creating shafts of light influenced my decision to depict light coming through the window broken up by the shade created by the window frame. In the final illustration, I used the colours from my moodboard to create the austere setting depicted in the text while also creating a shadowy feeling. By completing this exercise, I have learnt a lot about light sources and how to illustrate using light and shade. It has made me observe how light falls on things so now I can’t focus on anything else when watching a film! I have also explored different techniques for illustrating light. I found that using an eraser to rub out lighter areas was particularly effective. To create the slightly jaded, grubby walls, I used gouache which I moved about with a dry brush. This is a different technique for me and I think it worked really well in creating the effect I was trying to achieve. While I am happy with the light and shade I have created I am not so with the shadows across his face. They do add to the shadowy feel but I’m not sure I employed the right technique to create them. I initially used pastel but didn’t think it worked with the coloured pencil used on the man, so I erased most of the pastel and covered with black pencil marks to try to create some continuity. I really enjoyed this exercise. It was engaging subject matter and I really feel my skills have grown as a result. The word I chose for this exercise was ‘building’ because I am drawn to beautiful architecture and think that buildings can make great graphic images. I started by sketching a few different looking buildings to see which might work well graphically in black and white. I decided against the One World Trade Centre because it would have been too simple for the exercise, as would the Guggenheim. Contrary to this, the Taj Mahal and the more conventional ‘house’ type building are too detailed. I was initially interested by the Atomium because the balls are two tone which I thought would look effective in black and white. However this presented a problem with the background. One part of each ball would blend in or have to have a line around it. I briefly thought about and sketched an interior but didn’t think it would work graphically. So the Chrysler building it was! This is one of my favourite buildings because it love the Art Deco detailing. It was the Art Deco part I wanted to focus on in my image. Below is my line drawing of the top of the Chrysler building. The brief asked for A3 size. I don’t have an A3 printer so was unable to invert the image on my computer and print it out at home. I tried the photocopier at the library but it didn’t have an invert function but I was able to make some A3 copies. 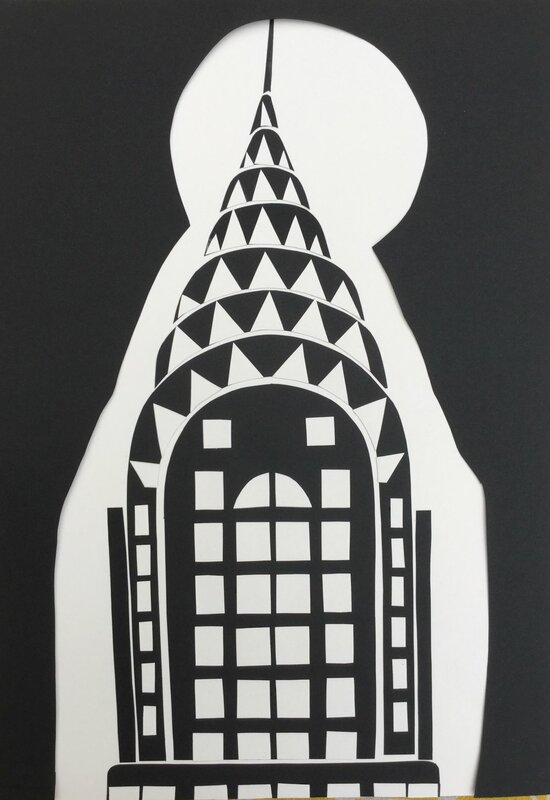 I then cut out the parts I wanted to be black and used as a template on black paper to produce the black shapes needed. I refined the image with use of white for the windows and roof detailing. I was really happy with the result. The use of black and white has really made the building come to life when compared to the line drawing. It gives it depth, especially in the roof section. Thinking that there should be something in the background, I toyed with the idea of creating a night sky behind the building. This was a bit of a problem though because the outside line of the building is black meaning it would just merge into the background. To solve this I had the moon shroud it in a glow of light. I don’t like this image as much as the building on its own though. The next part of this exercise was to make a subjective drawing of an object. I chose the cushion pictured below and brainstormed adjectives to describe it. I found it difficult to choose just one adjective as the basis of my idea for the drawing. The cushion is so characterful I felt that choosing just one would mean it’s essence would be lost, however once I settled on ‘shiny’ and started making my moodboard, I found this didn’t need to be the case. Without looking at the cushion but having the visual image of it in my mind, I started looking for and collecting shiny things that were similar colours. The shiny glass frog, shimmery gold paper and pink ribbon were all colours found on the original cushion. But this is a subjective drawing based on the word ‘shiny’ so the colours didn’t need to be the same. I found lots of shiny blues and purples and silvers and added them to the board. The brief for this exercise was asking me to use colours, textures and materials from my moodboard to translate the line drawing into an image that communicates the word ‘shiny’ so the colours I used are different to the original cushion. I used a mixture of metallic paint, shiny fabric, tin foil and acrylic with lacquered with clear nail varnish. I think I have achieved a shiny look, although it is all dependent on reflection of light so it looks shinier in some lights than others, hence the range of photographs below. I certainly focused on the word shiny to create my subjective drawing but am not sure if I exaggerated it enough. Perhaps use of foil in place of more of the metallic paint would have achieved more exaggeration. I chose a shoe as my object to make an objective drawing of. I chose this particular shoe because it has detail and reflects light well giving me lots of opportunity for adding tone. The drawing was done from a slightly different angle to the one shown in the photo. I am pleased with my objective drawing. I think the dimensions are accurate and I have created depth through my addition of light and shade. I varied my mark making and pressure to depict texture and contour. I felt confident to use a range of pencils for this drawing following my exploration of them in the previous exercise. I chose a freakshake to illustrate for this exercise because they contain lots of different elements, therefore providing lots of scope for texture work. I tend to prefer using mixed media, so for this exercise I wanted to stick with one type for each version but use it in different ways. I felt that this would help me going forward because it will give me a breadth of understanding and ideas about how to use each one. My choice of paper for each one was based on what I thought would give me an interesting or quirky effect. This was my first version and I think my least successful. I tried to use the colour of the paper to act as the colour of the milkshake and ice cream but I think this has left it looking flat because I haven’t added enough shading for depth. I found biro unforgiving and quite difficult to control in terms of pressure. I really like oil pastel on acrylic paper, the criss cross grain looks really effective when it just shows through, as seen here on the handle of the glass. The shake was made using pink as a base with some white over the top, smudged in with a blending stump. I like the ‘not quite mixed in’ effect this gave. The fondant fancy was also a pink base with white over the top but I used my finger to blend, leaving it a bit smudgy. I also couldn’t get the white icing to show up over the top. The meringue was a white base with small specks of pink smudged with my finger, this worked quite well. The strawberries were red blended with solvent to create a thinner, flatter colour. To create the ice cream, I used a mixture of white, red and grey to add shadow, all smudged/ blended with a silicone tool. I found blending different oil pastel colours together to be fairly easy, it worked well on the ice cream and bottom of the glass. The Swiss roll was scumbled which didn’t work very well because its layers lost definition. Overall, using oil pastel for a whole illustration is difficult because it is tricky to achieve detail and definition, but I love the blending opportunities and texture it provides. I really disliked creating this picture! The brush pen I used for the shake left lines on the glossy surface that I couldn’t get rid of, and it was squeaky to work on. The stippling on the swiss roll looks out of place. Colour choice is limited with pens and this really impacted on the picture. The most successful parts of the drawing are the handle and the shading on the meringue, both done in fine liner. This was done on the shinier side of brown paper and after the photo paper, I thought this may not work, but overall, it worked well except with very watery paint because the paper is quite thin. The shake was layered with thick gouache. I think this and the handle (again!) are the most successful parts due to the dry brush blending. I’m not happy with the ice cream on this version, I don’t think I used blending well enough to create shadow and depth. The meringue is a white base with impasto used for the pink bits, then a little water to smudge one end. As with the ice cream, I don’t think I have added enough shadow here. The scumbling on the swiss roll gives more definition than the oil pastel but it still isn’t quite right. I quite like the built in shadow the black paper provides against the white. The ice cream and meringue are both created using white watercolour pencil, leaving black for tone. Watercolour pencil shows up quite well on black paper, as shown on the fondant fancy, however a regular pencil doesn’t, as shown on the shake. The white watercolour pencil made a good creamy look on the white of the Swiss roll, but I found it difficult when trying to get the shading right on the handle. The black parts just blend into the background too much. This paper worked well for acrylic paint. Although not as sturdy, it is similar to acrylic paper in texture. The shake was painted with watered down acrylic, then white was layered over the top. Dry brush blending was used on the handle which worked well. Acrylics are great for impasto which I used on the ice cream and meringue to give them texture. The least successful part is the sponge on the Swiss roll because the scumbling has not made it look grainy enough. I was quite pleased with how this worked out considering wax crayons are very difficult to blend with, however the shake didn’t work because I couldn’t layer the pink on over the white. I did manage to achieve some blending on the handle and the meringue. The scumbling on the Swiss roll did not work, stippling would have been better. I really enjoyed creating this. It is the first time I have used solely soft pastel as a medium for an illustration. The colour in the shake is so vivid, it was created by adding the pastel to a water base. Paler pink and white were layered over the top. The texture of the watercolour paper really works for the ice cream and the Swiss roll, but doesn’t work well on the fondant fancy which has a very smooth texture. The edge of the glass and handle were created with a starting point of black, which was then blended using white. Soft pastels are easy to blend but are tricky to get a real definition, particularly on this textured paper. Despite the unconventional paper surface, I was pleased with this version. I have found monochromatic drawing difficult but I think this reflects my growing understanding about tone. It was created using a mixture of brush and nib. Again, I think the handle is the most successful part of this picture. I think the scoop of ice cream was also successful because the shadow from the grey paint gives it depth. I created the shake using the paint on wet technique but this gave an unsightly bloom on this paper, so I blended that out with further layers. I used wax resist for the icing on the fondant fancy which works so well under watercolour. The stippling on the Swiss roll works fairly well. Overall, this has been a great exercise. It has broadened my understanding of techniques that are good for creating different effects. I found it difficult sticking to one medium for each picture, but I’m glad I did because it forced me to use each in ways I wouldn’t otherwise have done. I will continue to use a mixed media approach, but I will do so with a fresher, more well informed hand. I started this project by mark making with pencils ranging from hard to soft, using differing pressure. Marks made included: hatching, cross hatching, waves, ‘jellies’, stippling, scumbling, zigzags, flicks and shading using the side of the pencil. I found the 4H to 2H pencils strange to use to begin with because they are not my go to choice of pencil. They seemed very hard and scratchy. However once I got going with them I could see how useful they are in providing definition and detail. I found that they enable drawing of lines much closer together without blending into each other. Lots of pressure is needed to create dark shading. I found the B and 2B pencils much easier to vary shading and tone with pressure than the H range, and stippling and scumbling became easier. With the 3B upwards, it became difficult to achieve any definition without having the pencil seriously sharp and working on a larger scale. This exercise has really opened my mind about using different pencils, I am now able to see how a range of effects can be created by varying the hardness of pencil used. I will take this forward in my sketching and in any monochromatic or limited colour palette work I do. I then explored the different pencils on different types of paper. The smoothness of the layout paper allows dots to be made very easily with all pencils, even the 4H. I stopped making marks at 2B because the paper wasn’t offering any interesting effects. The smooth cartridge paper was similar to the layout paper. The best range for creating effects was 2B - 4B. The mixed media paper provided a grainy effect with the softer pencils, as the tooth of the paper meant the white still showed through. However, the harder pencils fill the tooth, covering the white. Scumbling almost looks like shading with the softer pencils on this paper. The glossy photo paper has no tooth, it was very unpleasant and scratchy to work on even with a softer pencil such as the 3B. 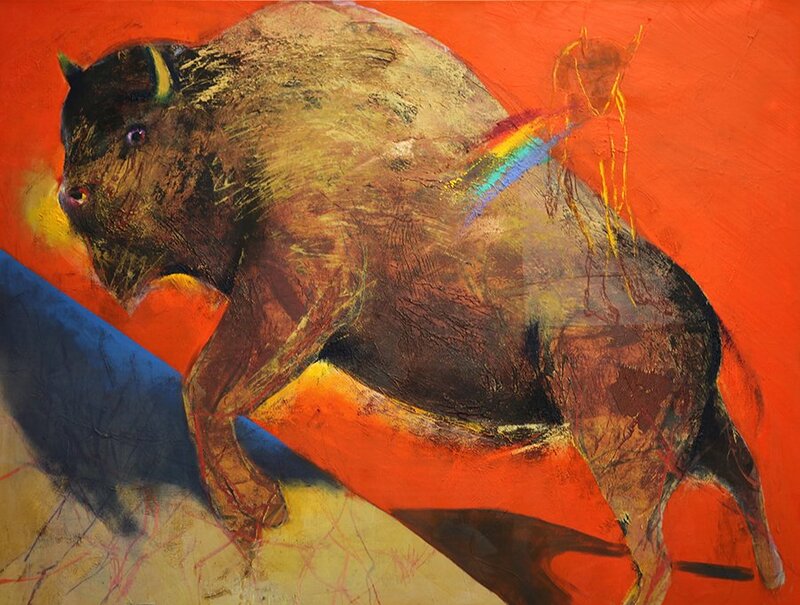 I had to press really hard to lay down any pigment, which in turn scratches the surface. Shading with the 6B pencil laying flat created a really nice effect on the acrylic paper. As with the mixed media paper, scumbling ends up looking like shading. Harder pencils fill the tooth more but the criss cross nature of the paper still shows through. A criss cross effect is created on pastel paper with a soft 6B pencil, much like on the acrylic paper. The harder pencils fill the tooth and are difficult to shade with. With light pressure using a 6B pencil on the medium grain watercolour paper, a wavy effect is created. Harder pressure begins to fill the grain. It creates a pitted effect, one that might be used to illustrate stone. Harder pencils fill the tooth. My next step was to explore various colour based media in depth. Coloured pencil - With these I explored techniques such as: layering, scumbling, stippling and burnishing. I tried different methods of blending including the use of solvent and tools such as a stubbie. I then tried pencil over and under other media and found that they are good for adding detail on top of a base but that they can also form a good base for media like charcoal pencils, watercolour pencils, oil pastels and pen. Coloured pencils are already one of my favourite mediums to use but this has widened my understanding of their creative possibilities. Watercolour - I started by trying different techniques and found blotting and splattering interesting ones to use. I also like the way watercolour works with wax resist crayons. I followed this by trying out other media over the top. Watercolour forms a good ground for most other media. Oil pastel - I explored the effects differing pressure has and tried out different ways of blending. I particularly liked the effect created by layering colour then scraping. They are good for adding texture. Oil pastels are a fairly new media for me and one that I want to continue to explore. Wax crayon - I found that wax crayons are not particularly versatile. You can vary pressure and create layers but the potential for blending is limited. Using solvent to blend lifts the colour. Soft pastel - With these I tried out different methods for blending and lifting of colour. I found the use of water with soft pastels interesting, as water over pastel creates an almost watercolour effect and pastel over water accentuates and deepens its colour. This is a technique I can definitely see myself using in my work. Brush pen, ink and biro - I concentrated mainly on mark making with the pens, exploring different pressures and strokes. I tried using the brush pen and the ink with water as well as dry. You can create nice effects with ink by adding a bold line then pulling away with water. I found that you have to work quickly though because once it is dry it is dry! It is possible to get some blending with brush pens and water but I feel that better blended looks can be achieved with other media. Gouache - I found gouache to be so versatile. I tried it with varying amounts of water with each creating a different look. No water made a thick opaque look like acrylic, while a watercolour effect can be created with lots of water, and there is no much variation in between! I tried out watercolour techniques such as wet on wet and paint on wet. It scumbles well and is great for adding detail onto a previous layer. It is also fun because it can be applied in lots of different ways with different tools and is fabulous for adding texture. Gouache also makes a good ground for other media. Acrylic - As with gouache, I tried applying in different ways with different tools. I find acrylic to be particularly good for blending, scumbling, scraping and impasto. It can also be watered down. My next exploratory step was too try each medium on each different type of paper, the results are shown below. This formed the basis for my choice of which paper to use in the ‘Exploring painting and Drawing’ exercise. 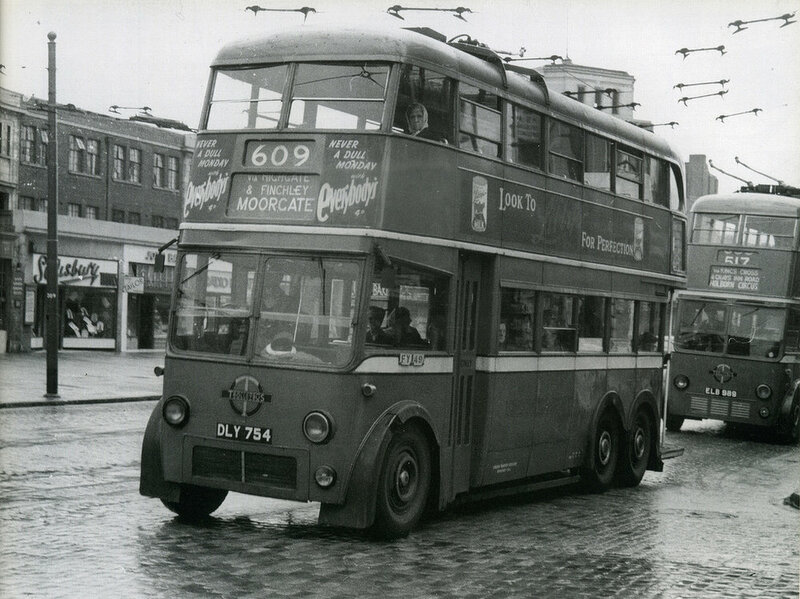 The 1950s was the golden age of public transport, in 1950 1 in 3 vehicles was a bus or a lorry. In the cities worn out trams were replaced by electric trolley buses and petrol buses which provided frequent services. The railways were nationalised with routes criss crossing the whole the country and plans to bring the steam era to an end. The motorway network was also modernised. Electronics and engineering had made great strides during the war and car sales were boosted with the end of petrol rationing in 1950. Few families could afford cars though, with many opting for the cheaper alternative of motorbike and sidecar. Bicycles were widely used both for commuting and recreation. The 1950s was a boom decade. The end of rationing in 1952; wartime advances in science and engineering; higher disposable incomes and ‘out with the old and in with the new’ in place of ‘make do and mend’ created a decade of consumerism which had a huge impact on its visual characteristics. 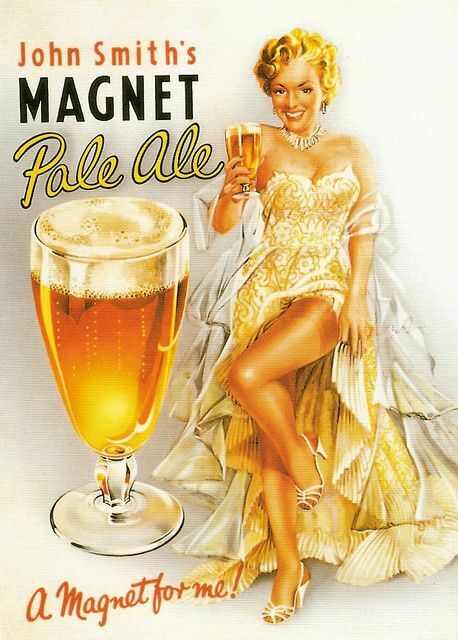 The 1950s was the dream decade for advertising companies. People had more money to spend so advertising was big business. But by today’s standards, the print advertising was mysogynistic, sexist, racist, politically incorrect and generally inappropriate! 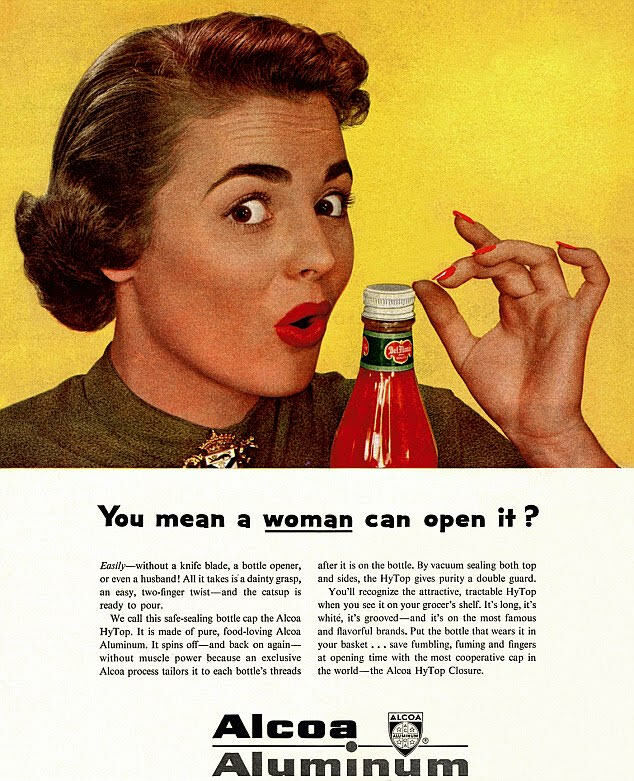 Sexual images of women were used to entice men into buying cars, cigarettes and alcohol while gender stereotyping was encouraged through adverts depicting the perfect housewife using particular products. Women were portrayed as being weak and submissive with some adverts even contained images of physical abuse toward them for making mistakes with the shopping or cooking. Adverts for drugs and cigarettes made outrageous claims about why they were ‘good for you’, even going as far as using pregnant women and babies in ad campaigns. They also weren’t averse to fuelling self esteem issues over weight! The 1950s was the era when graphic design superstars Paul Rand, Saul Bass, Max Bill and Milton Glaser started agencies and unveiled iconic logos.” (Brant Wilson www.inspiredology.com). In contrast to the softly painted images of happy housewives, these designers were bringing something new and more cutting edge. 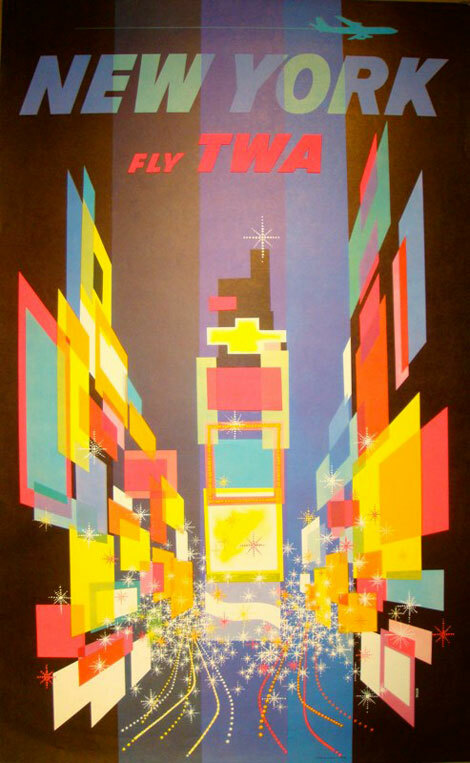 Their designs were bolder in colour, used geometric shapes and were stylish in simplicity. The trend in fonts was sans serif which complemented the modern aesthetic. Use of bright colours and geometric shapes give this a look that could be classed as contemporary now. 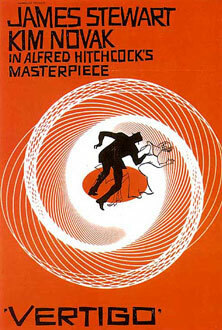 “From the 1950s and increasing number of graphic designers were drawn to the medium of the picture book. Designers were trained in drawing and typography (and in drawing type). 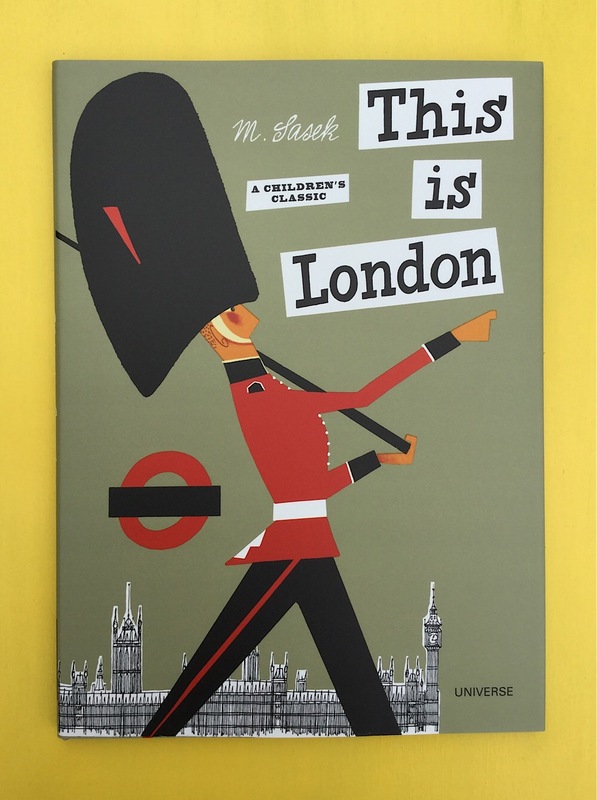 Suddenly, books that showed a unified approach to concept, image and typography were appearing.”Salisbury.M and Styles.M(2012)Children’s Picture Books: The Art of Visual Storytelling. London.LaurenceKing.p.29 . This was a time when the relationship between words and pictures was becoming more thoroughly understood and conveyed. The image below from Antonio Frasconi’s See and Say shows that the trend in design for advertising crossed over into picture book making, as did designers such as Paul Rand. 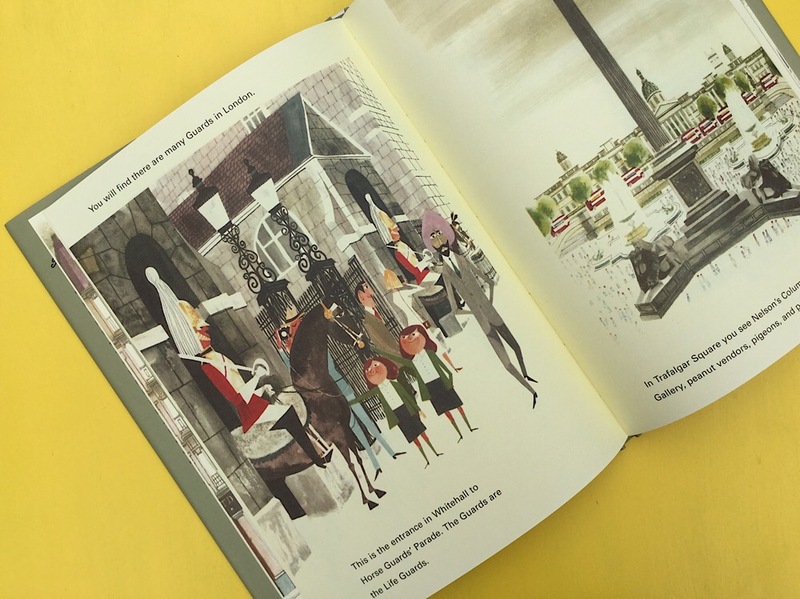 Miroslav Sasek was an authorial artist originally from Czechoslovakia who, inspired on a trip to Paris, created travel guides for children in the late 1950s and 1960s. The photos below are from This is Paris (1958) and This is London (1959). Note the sans serif font used for the text. The major movement in the 1950s was abstract expressionism with artists such as Peggy Guggenheim, Mondrian and Jackson Pollock being leading lights. Two areas formed within abstract expressionism, action painting and colour field painting. Action painting was all about the ‘feel’ when creating an artwork, Pollock and Franz Kline were two artists considered to be action painters. Artists such as Mark Rothko and Robert Motherwell were big names in colour field painting which, as its name suggests, was centred on colour. By the 1950s, television was more than a method of delivering information, with a major boom in its use coming with the live screening of the Queen’s Coronation in 1953. Popular shows were swashbuckling period drama series such as Robin Hood and The Count of Monte Cristo, trivia shows and entertainment shows like Sunday Night at the London Palladium. Comedy such as Hancock’s Half Hour was also popular. The latter part of the decade was heavily influenced by America with a rush of prize winning game shows and imported cop shows. In British cinema, the most popular genre of film was the British war film with two of the blockbusters of the decade being Bridge on the River Kwai and Dambusters. Comedy was also popular with Ealing Studios making films such as The Ladykillers and Lavender Hill Mob. Alec Guiness was a big star in the 1950s appearing in both war and comedy films. Rising comedy stars such as Peter Sellers and Norman Wisdom also appeared in the 1950s. Towards the end of the decade, Ealing comedies gave way to the rather less genteel and rather more absurd, early Carry On films. Hammer studios were making their lurid horror films with stars Peter Cushing and Christopher Lee starring in titles such as Dracula and The Curse of Frankenstein. Across the Atlantic, 1950s film saw the rise of the anti hero with actors such as Paul Newman, Ava Gardner, Kim Novak and Marilyn Monroe. As anti heroes James Dean and Marlon Brando led the way in rebellion and juvenile delinquency in their respective films, Rebel Without a Cause (1955) and The Wild One (1954). Cinema was gearing itself more to a youth orientated market with rock and roll films such as the Glenn Millar Story in 1954 and Elvis’ Rock Around the Clock and Love me Tender in 1956. Hoards of cheap teen movies were also made. For women, the 1950s were all about a return to femininity with the hourglass figure being celebrated by British designers such as Christian Dior. Waists were cinched with girdles being a must have item. Petticoats were worn to create bouffant skirts. In contrast to the wide skirts were wiggle dresses and pencil skirts, although the waists were similarly tight. Waists became looser towards the end of the decade. Fabric was plain, or patterned with florals, spots, plaid and stripes. Colours were quite bright. Accessories such as gloves and bags were a must for a lady, as was a spiked umbrella. Hats weren’t worn as much as in previous years for fear of ruining hairstyles. The beret and headscarves were popular though. At the beginning of the decade shoes had round toes with peephole toes. During the decade these gave way to the stiletto. The mass market, ready to wear, clothing industry really took off with brands like Marks and Spencer especially popular. The small dressmaker virtually disappeared and middle class women made their own clothes from patterns. My illustrations (below right) show two different styles of dress and are created in the style of dressmaking patterns (below left). I used gouache because I wanted bright block colour and oil pastel for shadow. Fashion was heavily influenced by film. Audrey Hepburn inspired capri pants, knitwear and flat ballet pumps were very popular and were great everyday items. This illustration by M. Sasek from his 1959 children’s book, This is London perfectly sums up male clothing in the 1950s. Men’s dress didn’t change much from work to leisure. Mostly they wore suits, although wearing a tie with a jumper or cardigan instead of jacket was common casual wear. Shoes were very important, often expensive and kept super shiny. Hats were also a must have accessory, as were pipes. Before the 1950s, the term ‘teenagers’ didn’t exist, there were children and youths. But in the fifties, these ‘youths’ were working and earning more money than ever before. They had their own places to hang out, their own music and could buy their own clothes. For the first time, they had their own fashion rather than wearing mini versions of adult wear. Influenced by stars such as Marlon Brando and James Dean, teenagers were adopting a ‘rebel’ look consisting of denim jeans, t shirts and leather jackets. Rock and Roll music inspired the Teddy Boy look. The sketches below show some of the teen fashion. 475,000 houses were destroyed or made inhabitable during the war which created a huge housing shortage. At the beginning of the decade many people were still living in slum conditions with no running water. To solve the problem, there were mass council house building projects with 2.5 millions homes built between 1946 and 1957. The trend in 1950s housing were flat roofs without chimneys, blocks of flats, inside bathrooms and plain brickwork. Due to the plain exterior, 1950s housing is widely regarded as being boring. Open plan living was on trend in the 1950s, often with a minimalist style. Furniture was all about ‘built in’ and space saving innovations. Cabinets opened into writing desks, tables had extenders and televisions were often built in to the furniture. It was influenced by Scandinavian design which is defined by clean lines and working with a material’s properties. The sketches below of 1950s furniture and lighting were made from photos in 50’s Decorative Art by Charlotte and Peter Fiell. Kitchens were built in with cabinets made from steel which was still in war production mode and therefore cheap. A ‘space age’ modern look with clean lines was popular. Functionality left little room for decoration. Kitchens were brightly coloured with laminate counter tops and linoleum floors. Below I have explored 1950s fabrics and textile trends using paint and printing techniques. At the beginning of the decade, detailed pictorial designs were common followed by geometric and more graphic style images in the latter half. Hand printing and screen printing were the most common techniques for creating textiles. Fashion and interior design are the areas that bear the most similarity to today. Capri pants, ballet pumps, stilettos, pencil skirts, duster coats and knitwear are still on trend. Mid century interiors are currently very fashionable, being revived as Mid Century Modern. I have a sideboard and sofa that would not have looked out of place in the 1950s. Scandinavian design is still hugely popular as are clean lines and built in kitchens. Lighting hardly seems to have changed either. Using the references gained through my research, my task was to create an illustration of someone sitting in a chair surrounded by typical artefacts to give a teenager an idea of the 1950s. I started by drawing out some potential layouts. 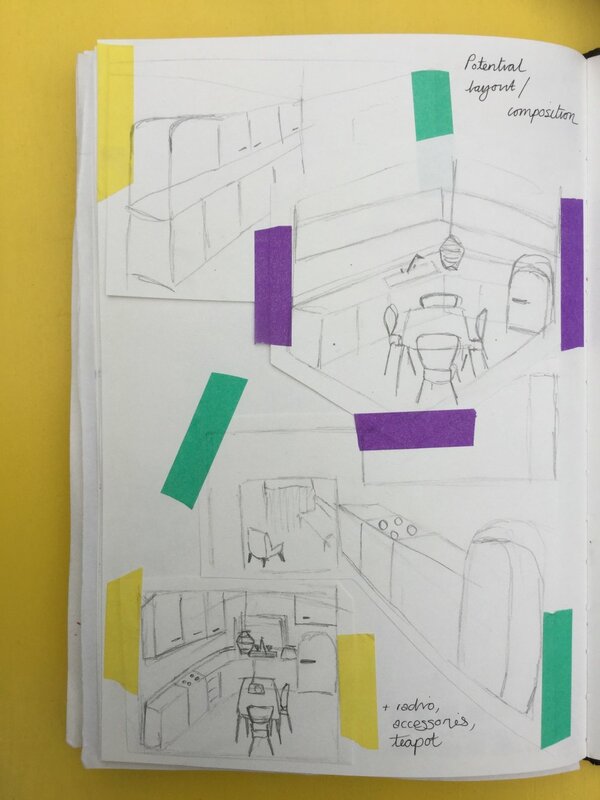 These drawings are below, they were copied from ’50s Decorative Art’ by Charlotte and Peter Fiell in order to practise my use of line and perspective. My first thought was to set my illustration in a kitchen. During the 1950s it was quite common to have a dining table in the kitchen so I incorporated one into my sketches (below left). Once I had created one I was happy with, I photocopied it and tried out different colour combinations. Use of colour was quite bold in kitchens, with pink, blue, yellow and green being quite popular. My next step was to add the seated figure. I knew from the start that I wanted my person to be a teenager because it would make the picture more relatable to a present day teenager. But as I started sketching thumbnails of figures to be seated in the kitchen, none of them had the slightly rebellious stance that I wanted to create. I wanted to convey the idea that this was the decade in which teenagers started to rebel, one in which they had their own identities rather than being mini versions of their parents. Imagining my teenager lounging in a chair in the living room, I scribbled the sketch at the bottom left. This was much more what I had in mind so I changed my setting accordingly. My process from there is shown below. Initial drawing with colour swatches. Exploration of materials and effects. The furniture, objects, clothes and colour were all chosen as a result of my research into the 1950s. I tried out different media and techniques in this illustration including: pencil, coloured pencil, watercolour, gouache, oil pastel and collage for the plant and magazine. If I was to complete the picture again, I would use a different colour blue for the sofa because this colour blends into the carpet to much. I’m also not sure the pencil drawing/shading of the coffee pot and jugs matches the style of the rest of the picture. 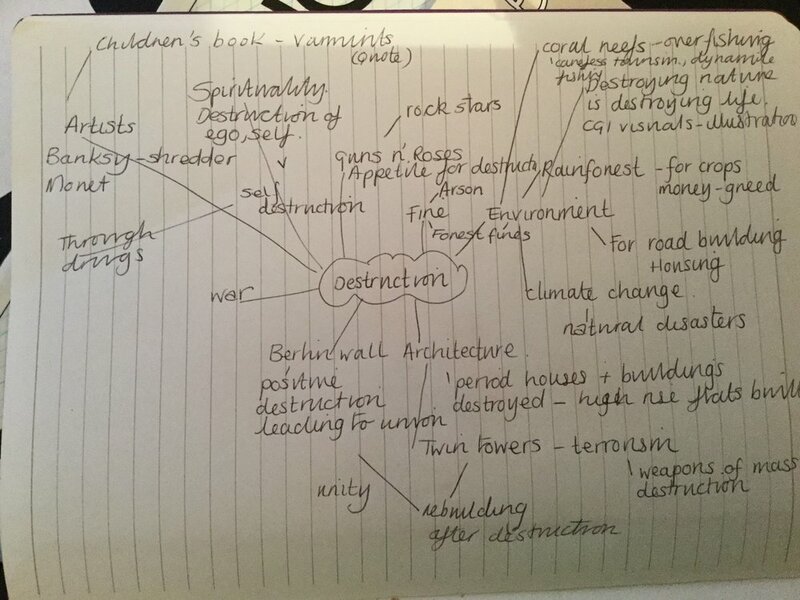 From the list of words we were given, I chose ‘destruction’ on which to create my moodboard and started my making a mind map of words and ideas associated with it. I also made more thorough notes on some of the ideas I particularly wanted to include. While researching destruction of nature, I came across CG images illustrating the slogan ‘Destroying Nature is Destroying Life’ created by Illusion in collaboration with environmental activists Robin Wood. This artwork is hard hitting and really struck a chord with me. Below shows their work and my process to creating my own version that I have included on my moodboard. I sourced the photos on the internet and used photoshop to see how best the photos should be laid on top of each other to try and create a scene. This was partially successful, particularly on the left and in the middle, however the right side doesn’t seamlessly flow. If I was to create the image again, I would also try to make the blend of the collaged part on the hedgehog’s head into the drawing smoother. The next part of the mind map I wanted to focus on was sea life and coral bleaching. Below shows my exploration of this idea. I explored the idea using different media, trying to create the look and texture of coral, then I remembered a suggestion from my tutor that I try to use digital techniques. So the coral on the right is my first attempt at scanning in a drawing to colour using photoshop! I was quite pleased with it but didn’t find the process nearly as enjoyable as creating art traditionally, and looking at the screen for so long made my eyes hurt! My finished ‘destruction’ moodboard. While I was exploring ideas, the hierarchy for the board became clear to me. I wanted to have the main focus on destruction of nature which is the theme for half the board. I’ve included one of the CG images mentioned earlier and my hedgehog and coral art work. In addition to that I included a picture and quote from a children’s book about the destruction of nature called ‘Varmints’. From here I chose to focus on destruction of our way of life and the threat of terrorism. I’ve visited the 9/11 museum in New York and was struck by the sense of unity and coming together such destruction can bring. The photo at the bottom right is a photo I took of a displayed photo of New Yorkers coming together at Ground Zero one year on. This unity after destruction took my thinking to the fall of Communism and destruction of the Berlin wall which also led to unity. The photos of the Berlin Wall are two I took while visiting a few years ago. Finally I wanted to include self destruction. The phrase pictured here is a common one among people experiencing low self worth and a torrent of negative thoughts. Basquait’s artwork is a perfect visual representation of it. I explored ways to create a burning tree look, including using charcoal from my fire which worked very well. I used the charcoal/pastel pencil method shown at the bottom on my final moodboard to depict a forest in various stages of burning. While completing this exercise I realised that it takes a lot of curation. I had to filter out some of my original ideas in order to visually communicate a particular theme within the theme of destruction. Many of the ideas on my original mind map weren’t included. I chose ‘kitchen’ as my word to turn into pictures. I think I chose it because I quickly formed lots of mind pictures connected with it. I drew without reference as many things as I could think of connected to the kitchen. The colour yellow featured because it does in my kitchen. When finished, I noticed that the pictures of the objects are in a similar style creating an organised and uniform feel, much like kitchens have. I think I have created a catalogue of images associated with the word, but I haven’t used a variety of materials, perhaps because kitchens usually have that uniform look about them. I also found adding textures difficult. The main properties of materials coming to mind were hard, smooth and reflective, the tin foil represents two of these. By choosing the word kitchen, I felt I had limited myself creatively. It conjured immediate images meaning I didn’t need to think more deeply. So I decided to do the exercise again and chose the adjective ‘wild’. In contrast to the kitchen pictures, these have a much looser, wilder look about them. I was much more carefree in the way I created the images. What I noticed most was the variety of strokes I used, curly, wavy, zigzag, compared with the straight and curved lines used in kitchen. I also used a range of materials and created the look of different textures. I was tasked with creating spider diagrams for the following words: Seaside, childhood, angry, festival. I started with angry and asked someone else to complete a separate one at the same time. In mine (on the left) I wrote down anything that came into my mind connected to the word including things with angry in the title, visual effects of anger, consequences and reasons. The diagram on the right focused much more on reasons for anger and was quite in depth in this area. We only had two words the same which I have circled on my version. We then took the word ‘childhood’ but this time created a spider diagram together rather than separately. We both took a very subjective approach, basing it on our own childhoods. I later decided I wanted to create another, more objective diagram which is shown underneath. My associations are in pencil, then I googled childhood and added those ideas in pink. Initially the search only resulted in information about stages of development so I had to change the search to childhood fun. The word ‘seaside’ was easier because it immediately conjures lots of mind pictures and visual associations. Living near the coast all my life also helped here. It was interesting to see how associations about something as universally well known as the seaside differ from person to person. My immediate thoughts went to Victorian holidaying, promenades and piers, while someone else thought about crabs, jellyfish and breakwaters. My ideas are in green below, the other person’s are circled in pink. The common ideas are underlined. The final spider digram was completed in tandem with my 18 year old daughter, her contribution is circled in pink. As you can see, we had totally different initial associations with the word totally influenced by our age! This exercise has really made me realise how differently people think and has helped me see the value and importance of primary and secondary research to help open up a subject and thoroughly explore ideas. For this exercise I was tasked with writing a brief that will have led to the creation of a chosen image. I have become interested in the work of Felicita Sala, initially in her illustration of children’s books and then in her food illustration. I also have real love for illustrated non fiction, cooking and cookery programmes I so thought one of her illustrated recipes would work well for this exercise. This recipe is from her website. The photograph below this shows some initial notes about what the brief could have been that I made in my learning log. However I felt like I missed a step. I felt like I needed to create a spider diagram about what the illustration shows before jumping straight in to write the brief. I also wanted to do some research into illustrated recipes to help identify a role for the image. The photo above shows my spider diagram. I researched food illustration in order to find a role. The research led me to a website called “They Draw and Cook’ which are cookery books featuring illustrated recipes. To begin with I thought this was perfect but the recipes are submitted by the artist, rather than there being a brief as such. I looked into food magazines and in particular contemporary and independent ones. I came across ‘The Gourmand’ but this wasn’t right because the images in that are either photos or hyper real. Eventually I found a New York based publication called ‘Diner Journal’ which features, “art, literature and recipes providing a thematic exploration into food, inspiration and creativity. This seemed a perfect fit for Felicita Sala’s contemporary style. My research also enabled me to pinpoint an audience more effectively. To illustrate a recipe for Thai Barracuda Soup to be featured in independent food magazine ‘Diner Journal’ which features art, literature and recipes. Diner Journal has a readership of design conscious cooks who enjoy trying new cuisines and being experimental and creative with food. The magazine is 13 x 18 cm in size so the artwork will need to fit those dimensions. The illustration will consist of a method to make the dish, together with images of the ingredients needed to make it. You will need to create an illustration of each ingredient separately: barracuda, coconut milk, Thai rice, green chilli, red curry paste, palm sugar, lime juice, yam or potato, coriander and salt and pepper. These should be positioned around the method which will read as follows: Heat coconut milk and some water in a wok. Add salt, pepper, sugar, chilli, curry paste and vegetables. Cook 5 minutes. Add fish chunks, cook 5 more minutes. Sprinkle with lime and coriander. This method should be handwritten and should form less than a quarter of the overall page. It should be placed amongst the ingredients, centrally positioned at the bottom. Each ingredient must be labelled, also by hand. Labels that vary from just the name of the ingredient are as follows: lime juice, a drizzle; 1 tbsp fresh coriander; yam or potato, cut into strips; barracuda chunks. The title of the dish should also be hand lettered and be positioned at the top of the artwork. The images will need to look true to life but there is scope for some stylisation. Distortion or surrealism are not appropriate because the ingredients need to be recognisable. Colours should be as they appear in real life, however there may be variation in tone. Any materials or media can be used with the exceptions of photography, printing or collage.